Petrography Sample preparation of metals and materials have become more and more important because of the rapid development and improvement of both software as well as OES and XRF-devices during the past few years that shifts the detection limit for trace analyses. It is crucial to have the sample properly prepared. The sample needs to be both representatives, homogeneous and with an even surface in order to eliminate factors that can influence the results. 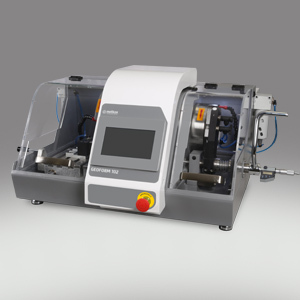 For the preparation of solid metal samples, Qualitest offers manual and automatic sample preparation machines - from the small table-top disc surface grinder to automatic milling machine. Geological Cutting Machine for sectioning of rock, ceramics, minerals, glass, concrete etc. Precision Thin Section Cutting and Grinding Machine for fast and precise material removal of petrographic thin sections. Grinding and Polishing Machine, single wheel, 0.75 kW motor with overload protection, variable speed between 50-600 rpm.